I have a feeling this kid is not going to make it very easy! Your kids are funny too! Post and share their best quotes at Quippsy. In other words, Grandma, I’m not saying please and thank you if you won’t even let me into the cookie jar! Have you stopped by Quippsy yet? 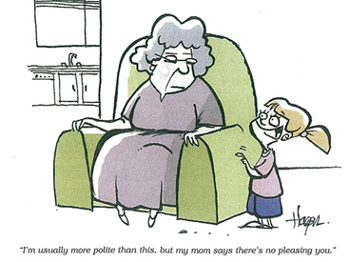 Keep track of all the downright cute and funny thing your kids say, then share them with your friends! Also: WordPress members get the royal treatment. 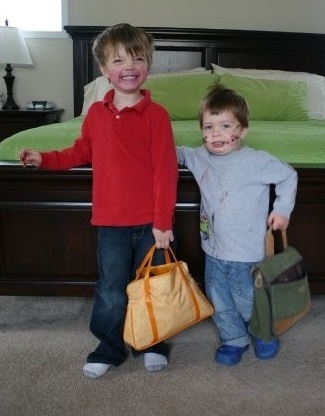 Have you heard the one about the little boys who got into their mom’s makeup kit? We’re looking for more stories like this one for our Tales to Warm the Heart series. Your story will be published on this blog, as long as you don’t mind it being subjected to light editing and delicate embellishment to fit the tone of the series. Submit your story here! Ever since he could talk, this was the mantra of our three-year-old son, Andy. Of course, my husband is absolutely in love with him, so he would do anything to make him happy. And recently, that included reluctantly removing the stubble from his face. Now, Andy has a love-hate relationship with hair—likes beards, hates stubble. Likes spraying his hair green and blue, then wants to chop it all off. And he really, really likes to copy his dad’s every move. So you can imagine that when Father Christmas brought him a toy shaver that year, well, it was like gold had rained down on a beggar. One Friday night, Andy and I were playing barber shop. He was thoroughly enjoying pretending to shave my hair off, then his dad’s, then sitting while dad “shaved” his hair off. “Oh boy!” Andy shrieked, the sparkle in his eyes so bright I thought they had been replaced by diamonds. I knew this couldn’t end well, but off he dashed to get the real electric razor, then sat begging his dad to plug it in. Here I’d like to mention that my husband is very particular about the way is head gets shaved. 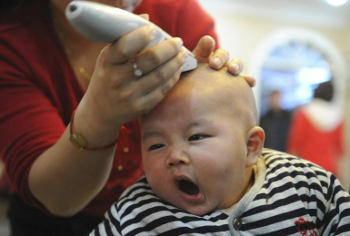 He complains that his barber is constantly pulling his hair. So already this wasn’t looking good—thinking that a three-year-old could do it without tugging on a few locks? But hubby sat down anyway, and waited for the buzzing to begin. 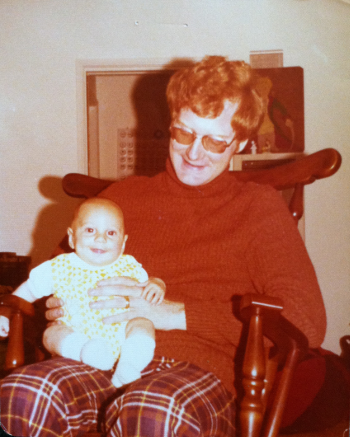 To my shock, Andy proceeded to shave off every single strand of his dad’s hair without pulling even one. He did an absolutely superb job. Then Andy handed his dad the razor and said it was his turn. I cringed. Andy’s hair had just started to grow in nicely after being bald the first two years of his life. Now the second he could feel the wind blow through it he wanted to shave it all off? But it was his head, and he seemed to know what he wanted, so I told my husband to go ahead and do it. All his hair was gone in two minutes, and my heart was bleeding, but when Andy looked in the mirror, he couldn’t help but grin ear to ear. My sister had just had her first baby, and I my third. As I was drowning in an endless day of trying to keep two active boys occupied while keeping a newborn on schedule, she called me. Being the good sister that I am, I took the call and listened to her drone on and on about how upset she was because she had only lost twenty-five pounds since having her daughter (a week before! ), and how she didn’t like breastfeeding but was worried that if she stopped, her daughter wouldn’t be as smart as she could be, yada, yada, yada. After assuring her that things would get better, I told her I really had to go and see what the kids were up to. She didn’t get the hint, so she stayed on the phone with me as I walked upstairs. I found the boys in my bathroom, covered in my makeup—lipstick, blush, mascara, you name it (which was also nicely decorating my shower door, counter top, and cabinets). Each kid had also slung one of my free gift totes from various makeup counters over his shoulders. I dropped the phone. Once the shock wore off, I asked the boys what they were doing. “We’re going to the city!” they both replied very matter of factly. That made me laugh so hard I nearly peed my pants. I made sure to snap plenty of photos of my pretty little men before they went out for their night on the town. I’m going to pause here, and ask that you please take a few seconds to sign up for the separate e-mail list for Tales to Warm the Heart, because then your e-mail inbox will be graced every day (or almost every day) with heartwarming stories like this one. It’s okay, go ahead…I’ll wait. But next on the list of things I hated with a soul-crushing passion was bathtime. And I don’t know if No More Tears shampoo was still on the drawing board or if we just didn’t have any, but every time shampoo got in my eyes, it felt like my eyeballs were being carved out with a melon-baller. You know, it stung. At any rate, that particular night, I was frustrated after a long day, plus sleepy, cranky, and not feeling much like having my hair washed. As my mom reached for that infernal bottle of what might as well have been battery acid, the words came out faster than my brain could produce them: “Mommy! Don’t sham Pimmy’s poo!” And I crossed my arms indignantly. I paused. Reflected. Huh? What did I just say? What kind of a child had my mother raised? And from the way she was slowly setting the shampoo bottle back down again, I could tell she was thinking the same thing. Needless to say, my hair went unwashed that night. After my mom toweled me off, I went back, embarrassed but relieved, to doing all the things 1-year-olds do for the rest of the evening. So then what comes after pretty school and kinnergarten? First braid? 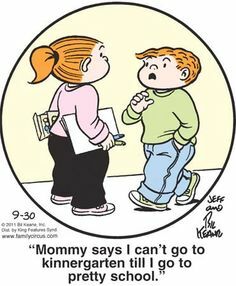 Family Circus, of course, is always hilarious, but so are your kids. Write down what they say with Quippsy, and share it with your friends and family. Create an e-book of these verbal memories to share with Grandma! Addicted to Quippsy on Second-best teacher ever!